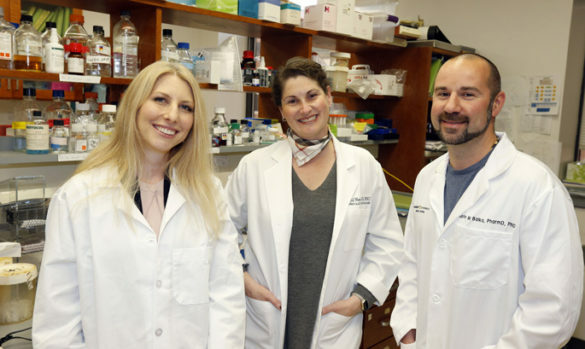 Several investigators in Vanderbilt-Ingram Cancer Center’s (VICC) Breast Cancer Program have received grant awards to support translational research that may improve disease outcomes for patients. The grants totaling more than $3 million will fund mechanistic science and clinical trials designed to test novel therapy combinations and determine why some forms of breast cancer become resistant to therapy. In recent years there have been great strides in treatment for early breast cancer, but in some patients the disease does not respond or becomes resistant to therapy and continues to spread or metastasize. Investigators at academic medical centers like Vanderbilt University Medical Center (VUMC), often with funding from the federal government and nonprofit foundations, are focused on helping patients with advanced disease. After the approval of several drugs that have greatly enhanced outcomes for many breast cancer patients, pharmaceutical firms now are teaming up with nonprofit organizations and foundations to fund new competitive research to accelerate testing of innovative therapies for advanced disease. Carlos L. Arteaga, M.D., who heads VICC’s Breast Cancer Program, said this new funding model is vitally important. “This type of peer-reviewed support from industry reflects a new approach in the way research is being funded that complements other traditional grant funding mechanisms. At a time when cancer research funding is in jeopardy and with the cost of translational research and clinical trials of impact, this diversification and expansion of funding is critical in order to make transformative advances,” said Arteaga, Donna S. Hall Professor of Breast Cancer, who also serves as associate director for Clinical Research and director of the Center for Cancer Targeted Therapies. Ingrid Mayer, M.D., MSCI, associate professor of Medicine, co-leader of the Breast Cancer Program and director of the Breast Cancer SPORE Clinical Core, has received a $1.2 million award from pharmaceutical firm Pfizer’s ASPIRE Breast Cancer Research Awards Program, which is designed to advance knowledge in the treatment and disease management of endocrine resistant, hormone receptor positive breast cancer. Mayer is serving as principal investigator for a multi-institution Phase 1b trial of a triple therapy combination of the drugs fulvestrant, palbociclib (CDK4/6 inhibitor) and erdafitinib (pan-FGFR tyrosine kinase inhibitor) for patients with estrogen receptor positive, HER2 negative metastatic breast cancer whose tumors show alterations in the FGFR cellular signaling pathway. Mayer, along with Justin Balko, Ph.D., Pharm.D., assistant professor of Medicine and Cancer Biology and leader of Molecular Oncology in the Center for Cancer-Targeted Therapies, will serve as co-PIs on another large multi-center trial evaluating multiple immune therapy combinations. The trial is supported by $1.5 million from Pfizer and the Breast Cancer Research Foundation (BCRF), and the VICC team will lead the combination therapy arm of the study testing the PD-L1 inhibitor avelumab and the MEK inhibitor binimetinib, which is based on laboratory work conducted by Balko. Patients with metastatic triple-negative breast cancer (TNBC) will be enrolled in the trial that will evaluate responses to a single immunotherapy drug and various combinations. The study is designed to provide further understanding of both tumor and immune factors that predict drug response or resistance. Anna Vilgelm, M.D., Ph.D., research assistant professor of Cancer Biology, has received a three-year grant of nearly $500,000 from the Breast Cancer Research Foundation through the Independent Investigator Drug Research Program to study how the body’s immune system reacts to certain breast cancer drugs. Vilgelm studies cyclin-dependent kinases (CDKs), which regulate cell growth and coordinate cell cycle checkpoints. Drugs that inhibit CDK4/6 help prevent cancer cells from multiplying and can prolong patient survival, but the tumors eventually start growing again. Vilgelm and her colleagues have discovered that treatment with a CDK4/6 inhibitor makes breast cancer cells release small proteins, called chemokines. Immune cells can sense chemokines and move toward them. The new study is designed to sensitize breast tumors to immunotherapy by first treating them with a CDK4/6 inhibitor. Investigators will determine if treatment with CDK4/6 inhibitors attracts immune cells into tumors and if these immune cells can be prompted to attack tumor cells using investigational immunotherapy drugs.